Wright State University and Residence Life and Housing have instituted a Student Code of Conduct and Campus Housing Policies in order to promote a safe community conducive to academic success. There are policies in the Student Code of Conduct that are specific to University Housing. The Residence Life and Housing Campus Housing Policies are specific only to residential students and their guests. Please take the time to review these policies so that you will know the behavior that is expected from students living in campus housing at Wright State University. Floor Standards are the agreements made by the residents on a given floor concerning how we will relate to each other and treat each other. While Floor Standards can be seen as a product—a list of agreements and expectations, Floor Standards is a process by which we begin forming a healthy community through dialogue, compromise, and commitment. Floor Standards evolve and therefore the process is never finished. Because Floor Standards evolve, they should not be thought of as a task to be completed but as a means by which interactions occur. An important aspect of Floor Standards is discussing and deciding how we will hold ourselves accountable for agreements and expectations. Discussing the issue of responsibility and accountability of each resident to every other resident can be difficult. This difficulty comes because many of us believe that someone else (i.e., a resident assistant, WSU police, community director) is responsible for making sure that I get exactly what I want. Another way to think of this is that many of us do not want to stand up for ourselves. Equally difficult can be the thought of holding a peer to a standard. Floor Standards is an on going process that defines mutual expectations for how the community will function on an interpersonal level. Floor Standards further provide a mechanism for the community to respond to behaviors that violate the agreements of the floor. In Residence Life at Wright State University we espouse that you, college students, are maturing adults. This means that you are making choices and learning from the outcomes of your choices. The young adult years are perceived as years of freedom, experimentation, limit finding, and limit testing. If the experiences during these years are to lead to an increased ability to make mature judgments then you must have the opportunity to make decisions so that you can experience the result of those decisions. An important area of decision making for college students concerns lifestyle and personal conduct. Traditional college-age people typically reject "rules" imposed from the "outside". They may reject authorities who appear to be trying to deny them their "freedom" or independence". At the very same time they may become angry with authorities who don't meet their needs at the time when they want their needs met. Floor Standards provides a means by which your expectations of the authority to meet your needs are shifted to a recognition that the individual and the community must work together to create an environment that best meets everyones' needs. The authority (RA) becomes a person who helps this process to happen instead of someone who fixes things for you or someone who always punishes behavior that is not in line with expectations. If every student lived in perfect isolation, he or she could conduct him or herself in any way. In reality, we exist within a tightly networked society. This means our behavior impacts other people, and in the same way, the behavior of other peoples impacts us. Because we are affected by one another's behavior, we tend to have expectations about what we consider O.K. for the other person to do. We may or may not realize that our behavior affects others or we may believe that everyone has the same expectations that we have. This last concept can extend to a point where we believe that everyone has the same expectations at the same time, i.e. if I want to listen to music now, everyone wants to listen to music now. If we are to live together in reasonable harmony, we must have the opportunity to express our expectations of how we want to be affected by others. By discussing these expectations you hear the range of expectations and therefore have a harder time holding on to the belief that everyone does "X" or that everyone wants the same thing that you want. Out of an awareness of expectations, you and your peers can discuss your different expectations and come to agreement on ways that you can live with the differences or compromise around the differences. This process may not be easy because it requires many people to achieve new understandings and new behaviors quickly. One of these is the ability to consider another's point of view as being valid and thus needing to be taken into consideration in one's point of view. The contest of learning that is created by the Floor Standards discussion can be a powerful tool to encourage student development and a healthy community. We have already identified how the process can cause an awareness of others. It can also encourage you to build self-esteem through declaring oneself, through assertive interactions, and through the empowerment that comes from group agreement. By establishing Floor Standards and shared responsibility, you and your peers are empowered to deal with problems before they occur. What about Residence Life & Housing and Univeristy policies and procedures? Residence Life & Housing and the University have policies and procedures by which all residents must abide. They represent the basic safety and management issues necessary to assure reasonable quality-of-life for all residents. Primarily they establish minimum behavioral expectations and are in agreement with local, state, and federal laws. Floor Standards do not replace these, nor may they be in violation of these. For example, a floor may not form a standard that candles be burned at each floor meeting as Residence Life & Housing has a policy against candle burning. However, these policies and procedures are of such basic nature that they should not impede a floor's ability to create the standards they desire. For a complete list of these please consult the Campus Housing Policies. How are floor standards developed? Floor Standards are developed through group discussion and consensus. Through this format each resident is afforded the opportunity to assert his/her point of view. An underlying tenet of this system is the belief that in order to have one's needs met, one must accept responsibility for participation in the system designed to negotiate one's needs. Through implementing the Floor Standards model, we are providing the opportunity for you to learn that you are responsible for your experience, and that you are not simply passive recipients of your experience. Recognition of this concept can lead to personal empowerment. 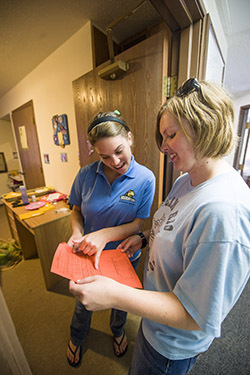 The staff person on your floor knows a great deal about Floor Standards. It's a long but beneficial process. Please feel free to ask questions and by all means, get involved! Unit Standards are a little bit different that Floor Standards for the traditional residence halls because they are not negotiated by an entire floor. They are just negotiated in an apartment unit between roommates. Unit Standards are the agreements made by the residents in a given apartment unit concerning how we will relate to each other and treat each other. While Unit Standards can be seen as a product - a list of agreements and expectations, Unit Standards is a process by which we begin forming a healthy community through dialogue, compromise, and commitment. Unit Standards evolve and therefore the process is never finished. Because Unit Standards evolve, they should not be thought of as a task to be completed but as a means by which interactions occur. An important aspect of Unit Standards is discussing and deciding how we will hold ourselves accountable for agreements and expectations. Discussing the issue of responsibility and accountability of each roommate to every other roommate can be difficult. This difficulty comes because many of us believe that someone else (i.e., a resident assistant, WSU police, community director) is responsible for making sure that I get exactly what I want. Another way to think of this is that many of us do not want to stand up for ourselves. Equally difficult can be the thought of holding a roommate who is a peer to a standard. Unit Standards is an on going process that defines mutual expectations for how the roommates in a unit will function on an interpersonal level. Unit Standards further provide a mechanism for the roommates of a unit to respond to behaviors that violate the agreements of the unit. Traditional college-age people typically reject "rules" imposed from the "outside". They may reject authorities who appear to be trying to deny them their "freedom" or independence". At the very same time they may become angry with authorities who don't meet their needs at the time when they want their needs met. Unit Standards provides a means by which your expectations of the authority to meet your needs are shifted to a recognition that the individual and the community must work together to create an environment that best meets every ones' needs. The authority (RA) becomes a person who helps this process to happen instead of someone who fixes things for you or someone who always punishes behavior that is not in line with expectations. If every student lived in perfect isolation, he or she could conduct him or herself in any way. In reality, we exist within a tightly networked society. This means our behavior impacts other people, and in the same way, the behavior of other peoples impacts us. Because we are affected by one another's behavior, we tend to have expectations about what we consider O.K. for the other person to do. We may or may not realize that our behavior affects others or we may believe that everyone has the same expectations that we have. This last concept can extend to a point where we believe that everyone has the same expectations at the same time, i.e. if I want to listen to music now, everyone wants to listen to music now or if I don't mind dirty dishes in the sink for a night or two then that will be O.K. with everyone in the unit. If we are to live together in reasonable harmony, we must have the opportunity to express our expectations of how we want to be affected by others. By discussing these expectations you hear the range of expectations and therefore have a harder time holding on to the belief that everyone does "X" or that everyone wants the same thing that you want. Out of an awareness of expectations, you and your roommates can discuss your different expectations and come to agreement on ways that you can live with the differences or compromise around the differences. This process may not be easy because it requires many people to achieve new understandings and new behaviors quickly. One of these is the ability to consider another's point of view as being valid and thus needing to be taken into consideration in one's point of view. The contest of learning that is created by the Unit Standards discussion can be a powerful tool to encourage student development and a healthy community. We have already identified how the process can cause an awareness of others. It can also encourage you to build self-esteem through declaring oneself, through assertive interactions, and through the empowerment that comes from group agreement. By establishing Unit Standards and shared responsibility, you and your roommates are empowered to deal with problems before they occur. What about RL&H, AM, and University policies and procedures? RL&H, AMS, and the University have policies and procedures by which all residents must abide. They represent the basic safety and management issues necessary to assure reasonable quality-of-life for all residents. Primarily they establish minimum behavioral expectations and are in agreement with local, state, and federal laws. Unit Standards do not replace these, nor may they be in violation of these. For example, a unit may not form a standard that their quiet hours will begin at 2:00 a.m. as RL&H has an established policy about quiet hours. However, these policies and procedures are of such basic nature that they should not impede a unit's ability to create the standards they desire. See the "policies" section of this Sourcebook for a full list of policies. How are unit standards developed? Unit Standards are developed through group discussion and consensus. Through this format each resident is afforded the opportunity to assert his/her point of view. An underlying tenet of this system is the belief that in order to have one's needs met, one must accept responsibility for participation in the system designed to negotiate one's needs. Through implementing the Unit Standards model, we are providing the opportunity for you to learn that you are responsible for your experience, and that you are not simply passive recipients of your experience. Recognition of this concept can lead to personal empowerment. The staff persons in your community know a great deal about Unit Standards. It's a long but beneficial process. Please feel free to ask questions and by all means, get involved! The use, possession, or carrying of weapons, including, but not limited to, pistols, rifles, shotguns, air soft guns, paintball guns, all pellet/BB guns, dangerous knives, ammunition, or any stun device, or other dangerous weapons is prohibited while on university-owned or controlled property, or at university-sponsored or supervised activities, except by university police officers and other persons specifically authorized by the University. For fire and general safety reasons the possession of firearms, ammunition, firecrackers, explosive or combustible materials, and/or injury threatening weapons are strictly prohibited. Individuals found to be in possession of a firearm may be subject to immediate cancellation of their Campus Housing Agreements and will face further university disciplinary and/or criminal action. The above mentioned policy also applies to guests of residents when they are visiting residents on campus. A resident who hosts a guest is responsible for the guest's conduct at all times, as well as any damages incurred by that guest. Guests must comply with all university and community policies. Guests who violate a policy may be asked to leave the community and/or university property, and may be subject to further university action. Residents are permitted to have guests at any time so long as they are considerate of the rights and privacy of their roommates, suitemates, and neighbors. A guest refers to any person who does not hold a residence contract or lease for the particular unit. The occupancy limit includes the residents of the room and their guest. The following are the maximum occupancy numbers per unit designation in the Resident Halls: Single Unit- 4 total, Double & Triple Unit-8 total and Quad Unit- 12 total. In the apartments the maximum occupancy of the space is always 12 people total. All roommates must approve of the guest before that individual is allowed to visit the unit. Any resident who hosts a guest is responsible for the guest's conduct at all times and any damages incurred by that guest. All guests must comply with all university and community policies. Students must remain with their guest at all times- they may not give a guest their keys, or leave them alone in the unit for any amount of time, or for any reason. If a guest violates a policy and is asked to leave the community by a staff member, the guest must comply. Failure to do so will result in a request for police assistance. Violation of this policy may include, but is not limited to, loss of visitation privileges, documentation, being trespassed from campus, and citation by University Police. We as Residence Life Staff expect students to respectfully and politely confront their roommates if they are having issues with their roommate’s guests. If the student is unable to resolve the issue through conversation, she or he should contact a Resident Assistant, or their Community Director for assistance. Guests under the age of 18 must be accompanied by their legal guardian. The Overnight Guest Policy is an extension of the Visitation, therefore, unless otherwise noted, all general visitation expectations apply. An “overnight guest” is defined as any person who does not hold a residence contract or lease for the particular room or apartment and intends to occupy the space overnight. Residents are not permitted to host overnight guests on consecutive weekdays or consecutive weekends. This policy is applicable to all of our residents, including those who live alone either by design or circumstance. The presence of overnight guests requires consideration and approval of all roommates. The right of a resident to occupy her or his room or apartment without the presence of an overnight guest takes precedence over the privilege of a resident to host overnight guests.